The Hyundai Elantra is a four-door, five passenger compact sedan. The Hyundai Elantra was introduced by the Korean car manufacturer in 1991 and was sold alongside the Excel as a slightly larger, more capable compact car. While the first generation of the car, like many Hyundai vehicles, was powered by a Mitsubishi engine, it didn’t take long for Hyundai to catch up and design power plants and platforms of their own. By the time the year 2000 rolled around the Elantra was very much its own vehicle. The fourth and current generation of the car hit showrooms in 2007, and the 2008 Hyundai Elantra is largely unchanged from the previous year’s model. For the American market, the Elantra is available with only one engine choice: a 2.0 liter 4-cylinder which is good for 138 horsepower and 136 lb-ft of torque. Depending on which state the car is purchased in, a slightly less powerful version of the engine which is rated at partial zero emissions can be substituted as standard equipment. The car comes standard with a 5-speed manual transmission, with the option of a 4-speed automatic, and both transmissions offer nearly identical fuel mileage. In keeping with Hyundai’s simple trim levels, there are only two versions of the Elantra, the GLS and the SE. The GLS is a fairly well equipped automobile for a compact, and it offers excellent crash protection along with 4-wheel anti-lock disc brakes hiding behind 15-inch steel wheels with plastic covers. The car comes standard with power everything and small touches like several storage compartments to help increase the utility of the vehicle’s cabin. The SE improves on things by adding traction control and electronic stability control, along with 16-inch alloy rims, air conditioning, cruise control and fog lights. Interior room matches up well with other vehicles in its class, making the Elantra a comfortable choice for four adult passengers. A 60/40 split folding rear seat also allows access to the trunk from inside the passenger compartment. 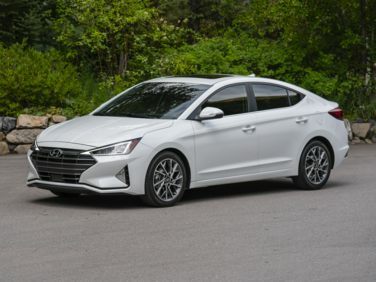 The vehicle’s soft suspension offers a smooth ride, but the Elantra does not suffer from soggy handling as a result – the car is reasonably responsive under hard cornering and doesn’t display the same level of under-steer as some of its main competitors. The Elantra does not trade on a sporty image like some of the other cars in the compact segment, and that helps it appeal to people who are simply looking for a good commuter car or something to take on short trips around town with a minimum of hassle. The vehicle isn’t buzzy om the highway, and turns in 33 miles per gallon with the manual transmission. Around town, mileage is an equally respectable 24 miles per gallon. The Elantra is an un-spectacular car, but sometimes that is exactly what a compact car should be. With good fuel mileage, decent interior space and a 10-year warranty on the engine and transmission, the Elantra makes a strong argument as an option for those looking for a car they can use day in and day out with a minimum of maintenance. The 2009 Hyundai Elantra is a carryover from 2008. The 2009 Elantra can be ordered in either GLS or SE trims. Both editions of the Elantra make use of the same 138 horsepower, 2.0 liter 4-cylinder engine that also generates 136 lb-ft of torque. Transmission options include either a 5-speed manual or 4-speed automatic transmission. Fuel mileage is rated at 24 miles per gallon in city driving and 33 miles per gallon on the highway.